This study reports on a corpus-based study of action nominalizations and their distribution in the thematic structure of introduction sections of research articles (RAs) across hard and soft sciences. Using the UAMCorpus Tool software, the corpus was tagged to locate the action nominalization instances. Manual text analysis was undertaken to exclude cases which did not comply with action nominalization criteria and to include instances of zero-derivation nominalizations. Action nominalizations were significantly more frequent in the introduction sections of hard science RAs (χ2= 39.850, P=.000). Results, however, did not show a significant difference in the lexical densities of the introduction sections of the two text groups. Moreover, the writers of RAs indicated a higher tendency to employ the action nominalizations in clause rhemes which may be attributed to the role of clause rhemes in the information structure of clauses. ESP writing instructors may use the findings of the present study to raise the awareness of the novices of the vital role of nominalization in facilitating their production of appropriate academic discourse. Recent decades have witnessed an increasing interest in the lexicogrammatical and rhetorical features of academic discourse on the part of applied linguists. Academic discourse is a social activity which aims to facilitate the production of knowledge in disciplinary cultures (Hyland, 1998). However, studies have shown that academic discourse is not uniform and monolithic (Hyland & Bondi, 2006), and so rhetorical and textual choices vary across disciplinary contexts (Yakhontova, 2006). Along the same line, Systemic Functional Linguistics (SFL) is claimed to provide insights into studying rhetorical and linguistic variations across disciplinary groupings (Dahl, 2004; Pho, 2008; Hylland, 2002; Lewin, 2005). SFL is a functional theory that addresses the functions that language has evolved to serve in society (Young & Harrison, 2004), offering systematic ways to analyze texts rhetorically. In SFL, language is seen as a configuration of meanings realized through different lexicogrammatical realizations or wordings (Halliday, 1994). Such realizations linguistically construe the world (Halliday & Martin, 1996 p. xi) and semiotically realize human experience in congruent or incongruent ways (Halliday, 1994, p. 342). From the SFL perspective, realizations of meanings can be achieved not only through unmarked or 'congruent' lexicogrammatical configurations but also through “incongruent” configurations. The incongruent realizations of meanings are considered to draw on a process called grammatical metaphor. In grammatical metaphor, "a meaning that was originally construed by one kind of wording comes instead to be construed by another" (Halliday, 2003a, p. 21). To set an example, academic discourse is marked by a tendency toward the technical or theoretical reconstrual of human experience (Reeves, 2005), which is typically achieved through the use of incongruent configurations (e.g., grammatical metaphor). Nominalization is "the single most powerful resource for creating grammatical metaphor" (Halliday, 1994, p. 352), and academic discourse is characterized by high frequency of nominalization (Biber, 1996). In nominalizations, "some element other than a noun, a verb perhaps, or whole clause, has nominal status assigned to it" (Halliday, 2003b, p. 58). As a by-product of grammatical metaphor (Halliday & Martin, 1996), lexical density ‎ is believed to be one major factor contributing to academic discourse (Eggins, 2004; Halliday, 1996). Lexical density is "a measure of the density of information in any passage of text, according to how tightly the lexical items (content words) have been packed into the grammatical structure" (Halliday 1989, p. 10). Lexical density is seen as a lexico-grammatical feature of rehearsed, polished, and redrafted discourse including academic discourse (Eggins, 2004, p. 96). Biber (2006, p. 17) attributes the high lexical density of academic discourse to the 'dense nominal packaging of information'. Nominalization as one of the most commonly used grammatical features of technical discourse (Lekme, 2005) is well motivated in English (Halliday, 1994). A host of studies have addressed nominalization (Comrie & Thompson, 2007; Halliday & Martin, 1996; Halliday & Matthiessen, 1999; Heyvaert, 2003; Leech, 2006; Moltman, 2007; Noonan, 2007; Rathert & Alexiadou, 2010; Zucchi, 1993). Such studies have investigated nominalization from different perspectives like syntactic (Chomsky, 1970; Grimshaw, 1990; Lees, 1968), semantic (Rathert & Alexiadou, 2010), functional (Banks, 2008; Halliday, 1994; Halliday & Martin, 1993), cognitive-functional (Heyvaert's, 2003), and textual (Downing, 2000). Many studies have investigated the employment and functions of nominalization in academic discourse in general and RAs in particular (e.g., Bhatia, 1992; Billig, 2008; Martin, 2008; West, 1980). Such studies have highlighted the crucial role played by nominalization in academic discourse. Martin (2008), for example, attributes disciplinarity in academic discourse to nominalization which helps "to organize discourse building knowledge and to distribute values during this process" (p. 806). Similarly, Martin (1991) discussed the role of nominalization in science and humanities texts, and argued that "in science, nominalization is strongly associated with definitions; its function is to accumulate meanings so that a technical term can be defined" (p. 333). On the other hand, Susinskiene (2009) reported that nominalization increased the information density and contributed to the cohesion of texts in scientific discourse. In a similar vein, West (1980) investigated the relationship between nominalization frequency and divisions in scientific RAs (e.g., introductions, methods, results and discussions). West (1980) reported a significant difference between the rhetorical divisions with regard to nominalization frequencies. Cunningham and Leeming (2012) compared the use of nominalization in popular science and academic discourse and argued that the use of nominalization was considerably higher in academic discourse than popular science. Jalilifar, Alipour, and Parsa (2014) explored nominalization types in an applied linguistics book and a biology book, and claimed that the employment of nominalization in scientific writing is linked to the principles of economy which aim to "save more time and energy by conveying more information with less effort" (p.41). In addition, Bhatia (1992) examined academic texts to unravel the importance of nominalization in academic discourse and discussed some of the tactics writers use to create nominalizations in order to enhance the accessibility of complex technical concepts in specialist genres. Furthermore, some studies have addressed lexical density in academic discourse. Mahbudi, Mahbudi, and Amalsaleh (2014), for example, compared the employment of nominalization and the lexical density of medical RAs written by native English writers and Iranian writers. They reported a lower frequency of occurrences of nominalizations in the abstract sections of the RAs written by Iranian writers. Following Wenyan (2012), Mahbudi et al. (2014) attributed the lower rate of the employment of nominalization by non-native writers to the lack of sufficient competence in and mastery of metaphorical expressions in English. In addition, Mahbudi et al. (2014) reported a higher lexical density for the abstract sections of medical RAs written by native English speakers compared with non-native speakers. They attributed the difference in lexical density of the RAs to the differential employment of nominalization in the abstract sections across English and Persian papers. Nominalization is, especially, regarded as a core rhetorical feature of RAs (Biber & Conrad, 2009). RAs are seen a high stake genre of academic discourse (Hyland, 2009; Parodi, 2010), and many studies have investigated the rhetorical and linguistic choices in RAs in order to investigate variations across disciplines in academic discourse (Hyland & Tse, 2004; Samaraj, 2002). RAs are usually divided into Introduction, Method, Results and Discussion (IMRD) sections (see Swales, 1990). Generally, the introduction sections play a significant part in problem specification and problem negotiation (Basturkmen, 2012). The introduction section of RAs has extensively been studied, and many studies have explored the salient linguistic and rhetorical features that characterize RA introductions in terms of moves (communicative function) and steps (linguistic realizations) focusing on the identification and mapping of the metadiscoursal features used to signal such moves and steps (e.g., Chahal, 2014; Milagros del Saz Rubio, 2011; Omidi & Farnia, 2016), lexico-grammar (e.g. Martı´nez,2003; Parkinson, 2011), and rhetorical organization (Hirano, 2009; Lin & Evans,2012 ). These studies have marked cross-disciplinary (e.g., Samaraj, 2002), cross-linguistic (Dueñas, 2010; Hirano, 2009), and sub-disciplinary (Jalilifar, 2010) variations in the introduction sections of RAs. To what extent is the distribution of nominalization different in the sample introduction sections of RAs across the soft and hard disciplines? To what extent are the nominalizing mechanisms similar or different in the sample introduction sections of RAs across the soft and hard disciplines? To what extent does the distribution of action nominalization vary across the theme-rheme positions of clauses in the sample introduction sections of RAs across the soft and hard disciplines? To what extent does action nominalization affect the lexical density of the sample introduction sections of RAs across the hard and soft disciplines? The study investigated the distribution of action nominalizations in the introduction sections of 300 RAs from the soft (N = 150) and hard (N = 150) sciences. Following Becher's (1989) taxonomy of scientific disciplines, RAs from the disciplines of Physics, Chemistry and Biology were analyzed as instances of the hard science disciplines, while Sociology, Psychology and Counseling represented the soft science disciplines. These disciplines are believed to be typical representatives of hard and soft sciences respectively (Becher & Trowler, 2001). To select the corpus, a list of ISI journals in each discipline was extracted from the Thomson Reuters 2013 Journal Citation Report (JCR). The list was then presented to two experts (e.g., university professors) from each discipline, asking them to mark those journals in which they have published or prefer to publish. Finally, journals which were marked by both experts in each discipline formed the data base from which the corpus of this study was drawn. Then, RAs which follow an Introduction-Method-Results-Discussion (IMRD) structure and had recognizable introduction sections marked by introduction headings formed the corpus of the study. The RAs in the corpus were restricted to empirical RAs published from 2000 onward. Native speaker status, the length of the introductions, and the number of authors (single or more) were not determining factors in forming the corpus. 1- Following other researchers (e.g., Comrie & Thompson 2007; Halliday 2003b; Leech 2006; Noonan 2007; Quirk et al., 1985; Rathert & Alexiadou 2010), the internal structures of noun phrases were analyzed and instances in which the nominalized verbs assume the role of the head noun of the noun phrase, and the arguments of the nominalized verbs that take on the status of genitives were regarded as action nominalizations. 2- Nominalizations are expected to include a syndrome of metaphorical features (Halliday& Martin, 1996, p., 60). Syndromes are "clusters of interrelated transformations that reconfigure the grammatical structure as a whole" (Halliday 1998, p. 214). Such syndromes may include a shift in the rank and/or a shift in function of an item. Syndromes are broadly categorized into lower rank syndromes (e.g., a clause is realized through a nominal group) and higher rank syndrome (e.g., a clause complex is realized through a clause). Nominalizations tend to involve lower rank syndromes. Hence, during the analysis, shifts in the ranks and functions of linguistic elements were taken as indications of nominalization. For example, in the following extract, a clause (these muscles are/were arranged) has been rank-shifted to a nominal group functioning as the theme of another clause. In addition, the concept of metaphorical syndromes was used to distinguish nominalizations from transcategorizations. 3- The concept of agnation was employed to analyze the congruent and metaphorical realizations, and nominal phrases for which agnates were provided were considered nominalizations, since "it is the nominalization for which alternative devices could be found, whereas there is ordinarily no alternative to the use of a simple common noun" (Halliday, 2003b, p. 58). In addition, since nominalization is believed to be used as a resource for generalizing and abstracting from particular objects, during the analysis, whenever a nominal structure with a structure like metaphorical nominalizations referred to particular physical entities, they were not considered nominalizations (e.g., combinations of group 4–9 transition, solid solutions). 4- Following Halliday and Matthiessen (2006) and Taverniers (2003), nominalizations resulting from the use of derivational morphology which did not demonstrate the above mentioned criteria were excluded from the analysis. Halliday and Matthiessen (2006, p. 242) believe that Indo-European languages draw on derivational morphemes to transcategorize "lexemes from one class to another". Halliday and Matthiessen (2006) argue that these transcategorizations can be explained with reference to everyday language 'without recourse to technicality' (p. 243). They distinguish meaning making by transcategorizing from meaning making by metaphorizing and imply that these cases are not taken as instances of grammatical metaphor (p.243). For example, although there are traces of grammatical metaphor in the derived nominal conclusion, it is not more than what we can find in everyday language (Halliday & Matthiessen, 2006). Taverniers (2003), too, states that some of the instances of grammatical metaphor have lost their metaphorical nature through demetaphorization and have been 'domesticated' (Taverniers 2003, p. 10). To quantify the occurrences of nominalization, the corpus was first annotated and searched to locate the nominalization instances derived from application of nominalizing suffixes, using the UAMCorpus Tool software. To do so, following Biber, Conrad, and Leech (2002), the corpus was tagged to locate derived nominalizations containing -age, -al, - ance (ence) -(e)ry, -sion, -(a)tion, -ment, -sis , -ure , and –th. The corpus, then, underwent a careful manual textual analysis to exclude cases which did not comply with the action nominalization criteria (e.g., transcategorizations or demtaphorized nominalizations) as well as to include action nominalizations resulting from conversion (i.e., zero derivation). Moreover, the corpus was tagged to locate the –ing endings, too. However, the –ing endings which did not meet the action nominalization criteria (i.e., gerunds or gerundive nominals) were excluded in the manual analysis of the corpus. In the literature ‎(Heyvaret, Rogiers, & Vermeylen, 2005; Quirk et al., 1985), configurations like a sound understanding of its reproductive biology are taken as action –ing nominalization, while instances like understanding the reproductive biology are deemed to be gerundive nominals‎. Manual frequency counts and text analyses were undertaken by the researchers, drawing on the aforementioned guidelines. Measures were taken to ensure the coding reliability of the analysis. To ensure the inter-coding reliability, the analysis was undertaken by two coders. The intra-coder reliability, on the other hand, was ensured through conducting the analysis on two occasions with a time interval of one month by one of the present researchers. The inter-coder and intra-coder reliabilities of the analysis were assessed through conducting Cohen's Kappa coefficient statistics which determined the reliability indices of 0.73, and 0.78 for the analyses respectively. In addition, to assess the lexical density of the sample introduction sections, the UAMCorpus Tool software was used. Frequency analysis showed that action nominalization was employed quite frequently in introduction sections of RAs in both hard and soft sciences which made up the corpus of the present study (Figure 1). Results are in line with the literature on nominalization in general as one of the defining characteristics of academic discourse (Banks, 2008; Biber, 1996; Halliday & Martin, 1996). The considerable frequency of occurrence of action nominalization across both hard and soft sciences can be taken as an indication of the continuity of the discourse employed by academic writers (Martin, 1993, p. 220). This can be an indication of the fact that academic writers employ similar lexico-grammatical mechanisms to construct meaning and interpret experience. However, as can be observed in Figure 1, action nominalization seems to be employed more frequently in introduction sections of hard science RAs. The considerable frequency of action nominalization in the introduction sections of RAs may be attributed to the requirement of the rhetorical structure of the introduction section. The introduction sections are typically structured in specific ways to achieve certain rhetorical goals. Swales (1990, 2004), for example, argued that the introduction section of RAs typically draws on certain rhetorical moves, which in turn, are comprised of certain steps. A major step in Swales conceptualization of moves and steps in the introduction sections of RAs is termed making topic generalizations (see Swales 1990, 2004). Nominalization of processes is a rhetorical mechanism which is claimed to generalize processes (Biber, Conrad, & Reppen, 1998). Hence, topic generalization may be a determining factor in the frequent employment of action nominalization in the introduction section. Note the following example where nominalizations (i.e., the removal of Li+, and enlargement of interlayer distances) are used to generalize a process (i.e., removing Li+, and enlarging the interlayer distances), and the nominalizations seem to have been used to generalize the experiential meaning of these processes as if the proposition conveyed through this clause always holds true. ….. The removal of Li+ causes enlargement of interlayer distances due to sheet repulsion. The results of a Chi-square analysis indicated that there was a significant difference between the frequencies of action nominalizations in the introduction sections across the hard and soft science RAs (χ2 = 39.850, P = .000). Results may point to the role of action nominalization as a lexico-grammatical feature which can differentiate the writing conventions across hard and soft science RAs. Findings seem to be in line with Biber (1988) who argued that nominalization is a lexico-grammatical feature which differentiates academic discourse across hard and soft sciences. Wells (1960), too, claimed that nominalization fundamentally differentiates registers. In a similar vein, findings support Baratta (2010, p. 1018) who claimed that "there may indeed be discipline-specific writing conventions with regard to how frequently nominalizations are used". MacDonald (1994, p. 171), too, concluded that writers in compact fields tend to employ nominalization more frequently than humanities. Similarly, Sarfo-Adu (2015) observed a greater tendency among hard science writers to employ nominalization in the abstract sections of RAs compared with the soft science writers. Results, however, contradict Biber (1995) who tends to question the role of nominalization across different registers. Similarly, findings contradict Vazquez Orta (2006) who reported a higher frequency of nominalizations in humanities and social sciences compared with physical and health sciences. The relatively higher frequency of action nominalization in introduction sections of hard science RAs can be attributed to the methodology of science which creates a tendency toward objectivity (Crystal, 1997) which consequently results in impersonality and precise description of phenomena. Argumentation in hard sciences is believed to be more objective, impersonal, and technical compared to the more subjective and abstract discourse in soft sciences. In this regard, Martin (1993) argues that the discourse of hard science is dominated by technicality which is achieved through nominalizing the processes and actions. On the other hand, soft science argument presentations have been reported to be more subjective and personal (Martin, 1993). As a result, there seems to be a higher tendency on the part of hard science writers to draw on action nominalizations to achieve rhetorical functions. Action nominalizations help writers rank-shift a clause into a single grammatical entity occupying a nominal position in another clause and functioning as participant in that clause. This is used to construct technical taxonomies which are predominant in hard sciences. The more frequent use of action nominalization in the introduction sections of hard science RAs can be taken as an indication of the more technical discourse in hard sciences. Technicality is believed to be enhanced through Classifier + thing constructions (Halliday & Martin, 1996). This configuration of nominalization abounded in the hard science RAs, while it was relatively less frequent in the soft science RAs. Instead, there seemed to be a tendency among soft science writers to modify nominals using Epithets. Note the following examples. ….. At x0=1 monoclinic distortion [classifier+ thing] was reportedforLixCoO2 with x=0.5 and studied by X-ray and neutron diffraction [classifier+ thing]. …..positive and negative framing [epithet1+epithet2+ nominalization] of factually equivalent information has been studied with regard to the communication involved in health-related decisions. …..We argue that both types of influences have the potential to shape life course changes in one key component of adult health – cigarette smoking. Similarly, Hyland (2001) argues that while hard science writers tend to suppress human agency, clear promotional and interactional purposes incline writers in humanities and social sciences to use personal pronouns extensively. That is because, through nominalization, human agency is lost in academic discourse leading to an abstraction in academic texts (Downing & Locke, 2006). That is, nominalization distances the argument from the event, raising the level of the abstraction of the situation (Downing & Locke, 2006). Note the following extracts. The following extract illustrates how nominalization has been employed to achieve abstraction in soft science academic discourse. ….. the appreciation of cultural capital may be higher in a high-achieving (and high-SES) environment. Action nominalizations in English are made using several linguistic devices. The rich array of suffixes in English as well as other linguistic mechanisms like conversion gives it a powerful nominalization creating potential (Biber et al., 2002). The analysis of the corpus of the present study showed that the most frequent suffixes used in the creation of action nominalization were -(a)tion, -ment,- sion, and –ance (ence). In addition, -ing action nominalization (Heyvaert, Rogiers, & Vermeylen, 2005) abounded in the sample article introductions (Fig. 2). Action normalizations derived from zero derivation or conversion (Biber et al., 2002) were also frequently employed in the introduction sections of the RAs. Other suffixes (e.g., -al,-age, -ency, -sure) were scarcely used, hence excluded from the analysis of the nominalization morphology (Fig. 2). As can be observed in Figure 2, action nominalizations derived using the (a)tion suffix were the most frequent nominalizations in both hard (63.7%) and soft (50.5%) science RAs. At the same time, action '-ing' nominalizations were the second most frequent category in the RA introductions (11% and 19.4% respectively). Other nominalizing suffixes (e.g., -ment, -sion, -ance, and zero derivation) were employed with comparatively smaller frequencies (Tables 2 & 3). Results of the study rather correspond to Biber et al. (2002) who observed that -tion, -ity, -er, -ness, -ism, and – ment suffixes were the most frequent nominalizaing affixes in their study. However, since the suffixes –ity and -er are not implicated in action nominalization, they were excluded from the analysis, while instances of –ism were nonexistent. Results are also to some extent compatible with Sarnackaitė (2011) who reported that –ion, -ment, -ing, and –ance were the most frequent suffixes in his study. Textual analysis of the thematic structure of clauses containing action normalization revealed that there is a tendency among the academic writers in both hard and soft sciences to employ action nominalizations more frequently in clause rhemes compared with clause themes (Figures 2 & 3). Descriptive statistics showed that 41.2 % of action nominalizations in the hard science RAs were employed in the themes of the clauses while 58.8 % of them appeared in the rheme position. The ratio differed slightly in the soft science RAs with 38.3 % of action nominalizations being used in the themes but 61.7 % in the rhemes of the clauses. There seems to be a need for conciseness imposed on academic writers from the desire to get their papers published. Brevity and conciseness are essential requirements for getting published and disseminating disciplinary knowledge. Academic writers are typically obliged to write as concisely and informatively as possible to convey their intended meanings and get their papers published. Action nominalization is a linguistic resource which helps writers meet the challenges of conciseness and informativeness. The higher tendency among academic writers from both hard and soft sciences to use action nominalizations in clause rhemes more frequently than clause themes can be attributed to the role of rheme as the focal point of the information structure of the clause. The rheme typically includes the New section in the given-new configuration of the information structure of clauses. Through action nominalization, writers are able to condense a lot of information in the rhemes, enhancing the information load of clause rhemes. This, in turn, helps writers achieve economy in writing. Academic discourse is believed to be dense both informatively and lexically as a result of heavy reliance on nominlizing clauses (Eggins, 2004; Pérez-Llantada, 2012). Hence it was expected that more frequent employment of action nominalization in the introduction of hard science RAs compared to soft science RAs might result in lexically denser introductions. To investigate the effect of action nominalization on lexical density of the introduction sections an ANOVA test was conducted. Results did not show a significant difference between the lexical density of the introduction sections of hard and soft science RAs (F (1, 41) = 0.108, p = 0.744). This does not seem to be compatible with the literature on nominalization according to which nominalization deployment in academic discourse is believed to contribute to the lexical density of texts. Findings, however, are in line with Gholami et al. (2012) who reported no significant difference in the lexical density of psychology and tourism RAs, on the one hand, and physics and engineering ‎ RAs on the other. In a similar vein, findings seem to contradict To et al. (2013) who observed that the higher the frequency of nominalization, the lexically denser texts are. The results of the study point to action nominalization as a characterizing feature of academic discourse. The considerable frequency of this strategy in the introduction sections of RAs across hard and soft sciences can be taken as an indication of the continuity of academic discourse (Martin, 1993). On the other hand, the greater tendency among hard science writers to employ action nominalizations points to the power of nominalization as a lexicogrammatical feature which can differentiate academic registers. The higher frequency of nominalization in introduction sections of RAs in hard sciences can be attributed to the methodologies of the disciplines which manifest a comparatively higher tendency toward objectivity and technicality both of which can be achieved through action nominalization. On the other hand, given the more subjective nature of discourse in soft sciences, the considerable frequencies of action nominalizations in the introduction sections of soft science RAs may be attributed to the tendency among writers to create abstraction and maintain conciseness in their respective discourse. Moreover, similar distributions of nominalization morphologies across the hard and soft science RAs are further indications of the continuity of academic discourse across discourses and registers. This may indicate that regardless of disciplines, academic writers draw on similar lexicogrammatical and rhetorical tools to engage with their respective communities. The introduction section is intended to persuade the readers that the issue raised by the study is significant and worth reading. This needs to be done as concisely and informatively as possible. Action nominalization helps academic writers condense a lot of information in a nominal group. Such informatively condense nominalization placed in the New (i.e., rheme) position in the information structure of clauses highlights the informative content of clauses, and helps academic writers get their message across more economically. Findings, though, did not contend the researchers' expectations with regard to the impact of nominalization on the lexical density of the RAs. This can be attributed to the fact that the focus of the present study was on lexical or action nominalization which comprise a subtype of nominalization in general. Findings seem to suggest that action nominalization does not affect the lexical density of RAs. However, further research is needed to delineate the impact of nominalization, in general, and action nominalization, in particular, on the lexical density of RAs. Findings of the study can raise EFL writing teachers' awareness of the productivity of nominalization and its impact on the structure and lexciogrammatical patterning of clauses in academic discourse. EFL writers can consequently embark on raising their students' awareness of the nominalization mechanism. This can be achieved through explicit teaching of the nominalization process which has been called for in other studies (Cameron, 2011; Fang & Schleppegrell, 2008; Wenyan, 2012). Through awareness raising and explicit teaching of nominalization mechanisms, ESP writing teachers can apprentice their students in the writing conventions of academic discourse. Banks, D. (2008). The development of scientific writing: Linguistic features and historical context. London: Equinox. Basturkmen, H. (2012). A genre-based investigation of discussion sections of research articles in dentistry and disciplinary variation. Journal of English for Academic Purposes. 11(2), 134–144. Becher, T. (1989). Academic tribes and territories: Intellectual enquiry and the cultures of disciplines. Milton Keynes: The Society for Research into Higher Education and Open University Press. Becher, T., & Trowler, P. (2001). Academic tribes and territories: Intellectual enquiry and the culture of disciplines. Buckingham: Society for Research into Higher Education & Open University Press. Bhatia, V. K. (1992). Pragmatics of the use of nominal in academic and professional genres. Pragmatics and Language Learning: Monograph Series, 3, 217-230. Biber, D. (1995). Dimensions of register variation: A cross-linguistic comparison. Cambridge: Cambridge University Press. Biber, D. (1996). University language: A corpus-based study of spoken and written registers. Philadelphia: John Benjamins Publishing Company. Biber, D., & Conrad, S. (2009). Register, genre, and style. Cambridge: Cambridge University Press. Biber, D., Conrad, S., & Leech, G. (2002). A student grammar of spoken and written English. London: Longman. Biber, D., Conrad, S., & Reppen, R. (1998). Corpus linguistics: Investigating language structure and use. Cambridge: Cambridge University Press. Billig, M. (2008). The language of critical discourse analysis: the case of nominalization. Discourse & Society, 19(6),783–800. Chahal, D. (2014). Research article introductions in cultural studies: a genre study exploration of rhetorical structure. The Journal of Teaching English for Specific and Academic Purposes, 2, 1-20. Chomsky, N. (1970). Remarks on nominalizations. In R. A. Jacobs & P. S. Rosenbaum (Eds. ), Readings in English transformational grammar (pp. 184-221). Waltham, MA: Ginn. Comrie, B., & Thompson, S. A. (2007). Lexical nominalization. In T. Shopen (Ed.). Language typology and syntactic description: Grammatical categories and the lexicon (pp. 334-381). Cambridge, New York: Cambridge University Press. Cunningham, S., & Leeming, P. (2012). The art of scientific writing. In A. Stewart & N. Sonda (Eds. ), JALT2011 conference proceedings (pp. 672-680). Tokyo: JALT. Crystal, D. (1997). The Cambridge Encyclopedia of Language. Cambridge: Cambridge University Press. Dahl, T. (2004). Textual metadiscourse in RAs: A marker of national culture or of academic discipline? Journal of Pragmatics, 36. 1807–1825. Downing, A. (2000). Nominalization and topic management in leads and headlines. In E. Ventola (Ed.). Discourse and community: Doing functional linguistics (pp. 355-378). Tübingen: Gunter Narr. Downing, A., & Locke, P. (2006). English Grammar: University Course (2nd ed.). London: Routledge. Dueñas, M. P. (2010). A contrastive analysis of research article introductions in English and Spanish. Revista Canaria de Estudios Ingleses, 61, 119-133. Eggins, S. (2004). An introduction to systemic functional linguistics. London: Continuum. Grimshaw, J. (1990). Argument structure. Cambridge, Mass. : MIT Press. Halliday, M.A.K. (1994). An introduction to functional grammar. (2nd. Ed.) London: Arnold. Halliday, M. A. K. (1998). Things and relations: Regrammaticising experience as technical knowledge. In J. R. Martin, and R. Veel (Eds. ), Reading science: Critical and functional perspectives on discourses of science (pp.185-237). London/ New York: Routledge. Halliday, M. A. K. (2003a). Introduction: On the architecture of human language. In J. Webster (Ed.). On language and linguistics: M.A.K. Halliday (pp. 1-29). London: Continuum. Halliday, M. A. K. (2003b). Grammar, society and the noun. In J. Webster (Ed. ), On language and linguistics: M.A.K. Halliday (pp. 50-73). London: Continuum. Halliday, M. A. K., & Martin, J. R. (1996). Writing science: Literacy and discursive power. London: Falmer Press. Halliday, M. A. K., & Matthiessen, C. M. I. M. (1999). Construing experience: A language-based approach to cognition. London: Continuum. Halliday, M. A. K., & Matthiessen, C.M.I.M. (2006). Construction experience through meaning. London/New York: Continuum. Heyvaert, L. (2003). A Cognitive-functional approach to nominalization in English. Berlin: Mouton de Gruyter. Heyvaert, L., Rogiers, H., & Vermeylen, N. (2005). Pronominal determiners in gerundive nominalization: A case study. English Studies, 86(1), 71-88. Hirano, E. (2009). Research article introductions in English for specific purposes: A comparison between Brazilian Portuguese and English. English for Specific Purposes, 28, 240–250. Hyland, K. (1998). Persuasion and context: The pragmatics of academic metadiscourse. Journal of Pragmatics, 30, 437-455. Hyland, K. (2002). Directives: Argument and engagement in academic writing. Applied Linguistics, 23, 215-239. Hyland, K. (2009). Academic discourse: English in a global context. London: Continuum. Hyland, K., & Bondi, M. (2006). Academic discourse across disciplines. Frankfort: Peter Lang. Hyland, K., & Tse. P. (2004). Metadiscourse in academic discourse: A reappraisal. Applied Linguistics, 25(2), 156-177. Jalilifar, A. R. (2010). Research article introductions: Subdisciplinary variations in applied linguistics. Journal of Teaching Language Skills, 2(2), 29–55. 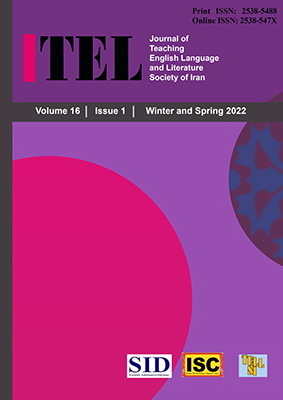 Jalilifar, A. R., Alipour, M., & Parsa, S. (2014). Comparative study of nominalization in applied linguistics and biology books.Journal of Research in Applied Linguistics, 5(1), 24-43. Leech, G. (2006). A glossary of English grammar. Edinburgh: Edinburgh University Press. Lees, R. (1968). The grammar of English nominalizations. The Hague: Mouton. Lewin, B. A. (2005). Hedging: An exploratory study of authors' and readers' identification of toning down in scientific texts. Journal of English for Academic Purposes, 4, 163–178. Lin, L., & Evans, S. (2012). Structural patterns in empirical RAs: A cross-disciplinary study. English for Specific Purposes, 31(3), 150–160. Mahbudi, A, Mahbudi L., & Amalsaleh E. (2014). A comparison between the use of nominalization in medical papers by English and Iranian Writers. International Journal of Applied Linguistics & English literature, 3, 1-6. Martin, J. R. (1991). Nominalization in science and humanities: Distilling knowledge and scaffolding text. In E. Ventola (Ed. ), Functional and systemic linguistics (pp. 307–337), Berlin: Mouton de Gruyter. Martin, J. R. (1993). Life as a noun: Arresting the universe in science and humanities. In M. Halliday & J. R. Martin (Eds.). Writing science: Literacy and discursive power, (pp. 221-267), Pittsburgh & London: University of Pittsburgh. Martin, J. R. (2008). Incongruent and proud: De-vilifying nominalization. Discourse & Society, 19(6), 801–810. Martínez, L. A. (2003). Aspects of theme in the method and discussion sections of biology jour­nal articles in English. Journal of English for Academic Purposes, 2, 103-124. Milagros del Saz Rubio, M. (2011).A pragmatic approach to the macro-structure and metadiscoursal features of research article introductions in the field of Agricultural Sciences. English for Specific Purposes, 30. 258–271. Moltman, F. (2007). Events, troops and truth making. Philosophical Studies, 134 (3), 363-403. Noonan, M. (2007). Complementation. In T. Shopen (Ed. ), Language typology and syntactic description, (Vol. 2). Complex constructions (pp. 52-150). Cambridge: Cambridge University Press. Omidi, L., & Farnia. M (2016). Comparative generative analysis of introductions of English and Persian physical education research articles. International Journal of Language and Applied Linguistics. 2(2), 1-18. Parkinson, J. (2011). The discussion section as argument: The language used to prove knowledge claims. English for Specific Purposes, 30(3), 164-175. Parodi, G. (2010). The rhetorical organization of the textbook genre across disciplines: A 'colony-in-loops'? Discourse Studies, 12, 195-222. Pérez-Llantada, C. (2012). Scientific discourse and the rhetoric of globalization: The impact of culture and language. London: Continuum. Pho, P. D. (2008). Research article abstracts in applied linguistics and educational technology: A study of linguistic realizations of rhetorical structure and authorial stance. Discourse Studies, 10(2), 231-250. Quirk, R., Greenbaum, S., Leech, G., & Svartvik, J. (1985). A comprehensive grammar of English language. London: Longman. Rathert, M., & Alexiadou, A. (2010). The semantics of nominalizations across languages and frameworks. Berlin: De Gruyter Mouton. Reeves, C. (2005). The language of science. London: Routledge. Samaraj, B. (2002). Introductions in RAs: Variation across disciplines. English for Specific Purposes, 21, 1-17. Sarfo-Adu, K. (2015). Nominalization in research articles abstracts: A comparative study. European journal language studies, 2, 56-66. Susinskiene, S. (2009). Textual functions of nominalizations in English scientific discourse. Žmogus ir žodis, 11(3), 58-64. Swales, J. (1998). Other floors, other voices. London: Lawrence Erlbaum. Swales, J. M. (2004). Research genres: Explorations and applications. Cambridge: Cambridge University Press. Taverniers, M. (2003). Grammatical metaphor in SFL: A historiography of the introduction and initial study of the concept. In A.M Simon-Vandenbergen, M. Taverniers, & Y. Ravelli (Eds. ), Grammatical metaphor: Views from systemic functional linguistics (pp.5-34). Amsterdam: John Benjamins Publishing Co.
To V., Lê T., & Lê Q. (2013). A comparative study of nominalization in IELTS writing test papers. International Journal of Innovative Interdisciplinary Research, 4, 15-21. Vázquez Orta, I. (2006). A corpus-based approach to the distribution of nominalization in academic discourse. In A. N Hornero, M. J. Luzón, & S. Murillo (Eds. ), Corpus linguistics: Applications for the study of English (pp. 399-416). Bern: Peter Lang. Wenyan, G. (2012). Nominalization in medical papers: A comparative study. Studies in Literature and Language, 4, 86-93. Wells, R. (1960). Nominal and verbal style. In T. Sebeok (ed. ), Style in language (pp. 213-20). Cambridge, Mass. : MIT. West, G. K. (1980). That-nominals constructions in traditional rhetorical divisions of scientific research papers. TESOL Quarterly, 14(4), 483-189. Yakhontova, T. (2006). Cultural and disciplinary variation in academic discourse: The issue of influencing factors. Journal of English for Academic Purposes, 5. 153-167. Young, L., & Harrison, C. (2004). Systemic functional linguistics and critical discourse analysis. London: Continuum. Zucchi, A. (1993). The language of propositions and events: Issues in the syntax and the semantics of nominalization. London: Kluwer Academic Publishers.